When shopping for a water softener, there are a number of factors to consider. This page and our team of experts are here to help you choose the right water softener for your needs. This page will help guide you to find the best softener for you. *Example: A family of 4 on city water with a hardness of 22 GPG would need a 40,000 GRAIN water softener. The correct size water usage and softener should regenerate at least every 9 days, but usually regenerates approximately every 7 days. Therefore, a family of 4 would regenerate at least 4 times per month. *Based on a minimum life expectancy of 15 years for a 40,000 grains water softener, the Upflow Genesis water softener would save this family 8,280 lbs of salt! Type. Determine which type works best for you. The Genesis Revolution Upflow Series not only achieves higher flow rates needed for today’s larger homes but also offers high-efficiency performance. The Genesis Revolution uses up to 75% less salt and 64% less water on every regeneration. Backed by the best warranty in the industry. The Genesis Duo takes the ultimate high-efficiency water softener and pairs it with a premium whole house filtration system all in one. 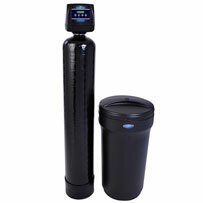 The only water softener and filtration combo done right. The Genesis Upflow and Premier model water softeners save up to 75% on salt and 64% on water making the Genesis water softener the ideal choice for most homes. Backed by the best warranty in the industry. The basic on-demand down flow water softeners are the obvious choice for the price conscious home owner looking for a reliable solution. Our basic Fleck on demand systems are designed for years of use and built to your specific need. Choose from our Genesis High-Efficiency Upflow, basic on demand Fleck or our timered Fleck model water softeners for a compact all in one system for tight spaces. Our commercial water softeners are ideal for high flow or high usage applications. Whether you have a restaurant, car wash, hotel or production application, we have the system and technical staff to that will fill your needs. Our line of high efficiency and high flow rate Genesis whole house water softeners utilize innovative upflow technology, which provides unmatched performance and savings that no other standard downflow water softener can beat. Genesis water softeners use the industry proven, internal mechanical piston regeneration process that has been in use for over 30 years. Our standard Fleck water softeners do feature internal piston driven regeneration, but they only regenerate in a downflow manner, much like other water softeners on the market. Genesis' upflow regeneration is much different and has been proven to reduce salt usage by as much as 75% and water usage by 65% over standard, downflow regeneration type systems. That reduction in salt and water usage can save you as much as $479 and 2,500 gallons of water every single year. No other water softener can do that, all while providing up to an industry leading 10-year control valve warranty and lifetime tank warranty. Why aren’t there any reviews on the Genesis softener? The Genesis Upflow, high efficiency water softeners are manufactured by a company that has been in business for over 50 years. They have offices available in the USA and Canada. Discount Water Softeners is the only company to carry the Genesis name, and we currently only sell our line through our website. For proprietary reasons, we are not authorized to list the manufacturer on our website, but the parts are readily available as well as warranty and support. All Genesis and Fleck water softener warranty issues are handled directly through Discount Water Softeners. 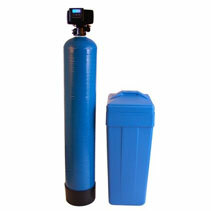 We are a water softener company that has been in business over 20 years. We are not here to just make a sale and leave. We stand by our products and are here to help our customers after the purchase and for many years to come. The manufacturer makes the ultimate approval on warranty coverage. A photo of a manufacturer failure would ultimately need to be approved by the manufacturer for warranty coverage. If you have any support questions after a purchase, please browse our Support page. Besides the great salt and water savings, what’s really the difference between the Fleck and Genesis? We like to ask our customers this question: Would you prefer purchasing the older type of washing machines that use 80% more water and 50% more soap, or would you purchase the HE (high efficiency) washing machines that use significantly less? The Genesis is the new, high efficiency water softener of today, which our competitors literally sell for hundreds and even thousands of dollars more. In addition, the Genesis water softener is pre-programmed to do a “Refresh Rinse” every 7 days if you do not use enough water, thereby rinsing off the pre-existing calcium, magnesium and iron attached to the resin and “fluffing it up” to prevent channeling (clumping of the resin) and bacteria build up. The salt savings alone far exceeds the cost difference of a Genesis over a Fleck. In most cases, the difference is only a couple hundred dollars up front, but the savings over the next 15 years is over $1,000 plus dollars. In addition the Genesis line has a longer warranty that covers 100% of all parts on the control head and you receive a lifetime warranty on the resin and brine tanks. The only thing not covered under warranty is the resin, which lasts between 12-15 years. Should I buy a Genesis or a Fleck? That’s a great question, which we are asked by customers every day. The long-term value and savings of high efficiency is our recommendation, however, we understand some customers shop solely based on price and reviews of the Fleck and feel comfortable purchasing it based on the reviews and do not want to go with newer, more efficient technology. We ask customers to look at our Bizrate and Home Advisor reviews and company as a whole to make the best decision based on everything and not just one item. If you are not sure which size water softener is best for your family, our support team are happy to help answer. They are here to answer any questions you have and recommend the appropriate system for your needs.